I name Her as Radha. She lives in my ritual space, and is decorated for each Seasonal Moment – here She is dressed for Imbolc/Early Spring, the Moment in the PaGaian Seasonal Wheel for the celebration of the particular unique self, the Cosmogenesis quality of differentiation (See PaGaian Cosmology Chapter 4 for a bit more about that). But what She sees is multivalent … She is All: and so We are. That truth is not for the faint-hearted … it requires daring: as does the truth that we are each unique …”there are no models for who we are to become” as cosmologist Brian Swimme once said in his Canticle to the Cosmos DVD series (video #9). It is good to live with Her everyday – this image, so that She may be quietly contemplated. I am always understanding more of What She sees. 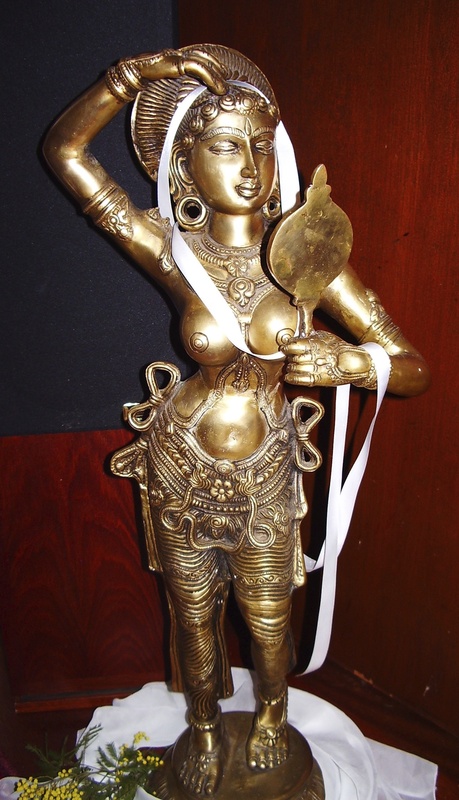 The Imbolc/EarlySpring Meditation on the PaGaian Cosmology Meditations CDs is based on this image of Goddess Radha beholding Herself. The CDs are available for purchase on the linked page – they have had very good reviews.